Gomer's Song is a re-rendering of a Bible story. Gomer, a harlot, was the wife of the Old Testament prophet Hosea. But even after marriage to Hosea, she refused to conform to her expected role. In Gomer, poet Kwame Dawes finds the subject for a beautiful contemporary exploration on the cost of arriving at freedom with an uneasy grace. Dawes examines the insidious nature of power, the expectations of gender roles, and the limits of protest. Through Gomer's journey, we are asked to consider how each one of us must articulate not only our own defiance, but tally the costs of earning our individuality. Gomer's Song is a great fable for finding our humanity in the confusion of a post-9/11 world. This is tender a book with profound lyrical insights. 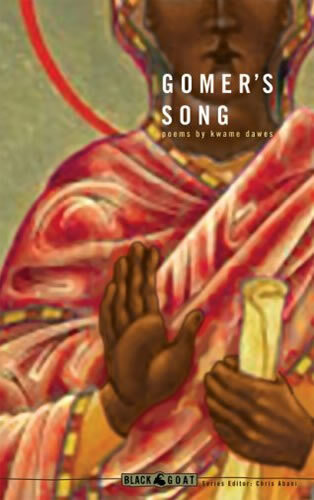 "As someone who professes to be a writer, I'm struck dumb by Kwame Dawes's pinpoint and devastating lyricism and the unflinching assurance of each and every stanza. These gems, threaded with mesmerizing narrative, exhibit both unbridled imagination and a lean technical mastery, a combination that Dawes's fans rely on. This is the kind of work writers strive for. This is Dawes at the pinnacle of what he does."